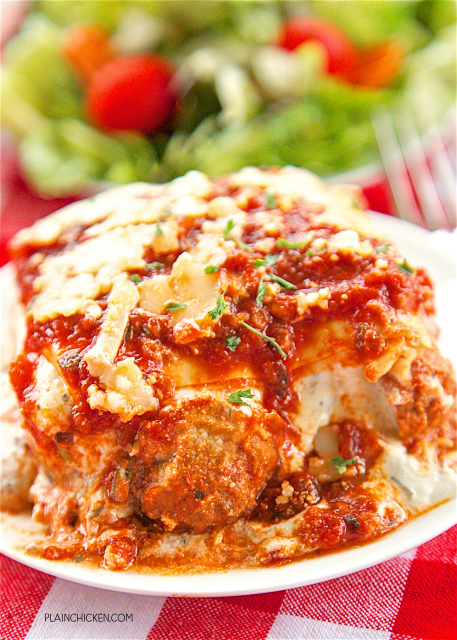 Meatball Lasagna - no meat to brown and no noodles to boil. 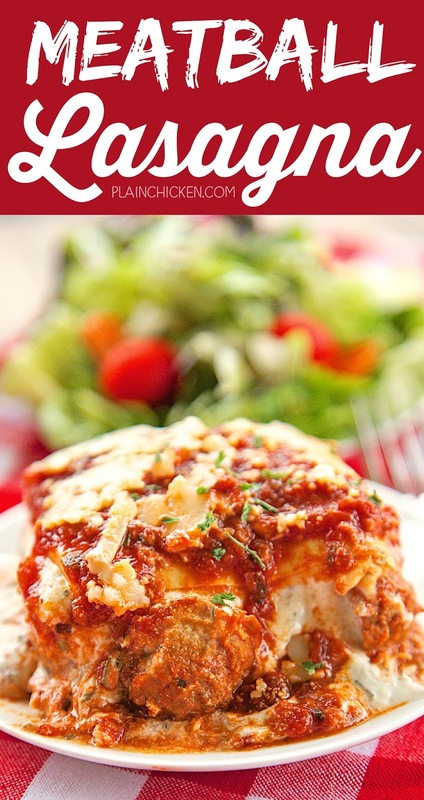 Great weeknight casserole! Ricotta, mozzarella, parmesan, chive-and-onion cream cheese, pasta sauce, egg roll wrappers and frozen meatballs. Ready for the oven in minutes!! Everyone loved this lasagna!! SO easy and SO delicious! 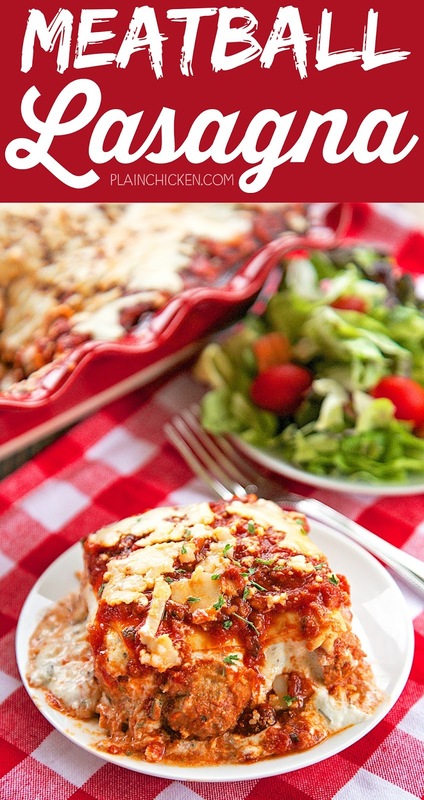 This lasagna is a fantastic weeknight meal. There is not meat to brown and no noodles to boil. It is ready for the oven in a flash! Woohoo!!! Can't beat that. 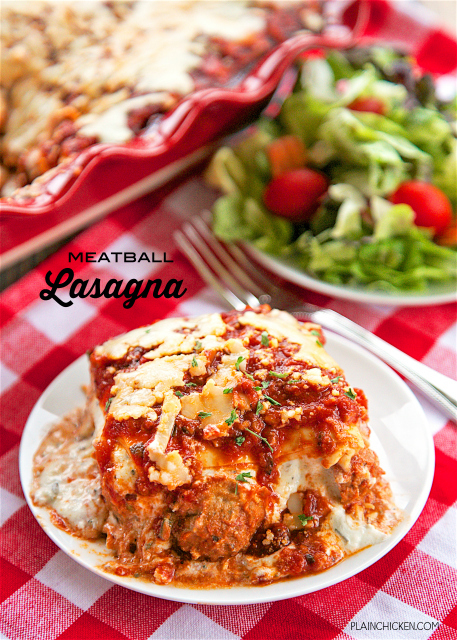 I love lasagna, but my homemade lasagna takes a lot of time to make. This Meatball Lasagna was ready to bake by the time the oven had preheated. Easy and super delicious! We loved this! It was great for dinner, but I think it was even better reheated for lunch the next day. All you need is a few garlic rolls and a salad for a fabulous weeknight meal. This would be great for a potluck too. It makes a ton! Stir together ricotta cheese, chive-and-onion cream cheese, basil, garlic salt, black pepper, egg, 1/2 cup mozzarella cheese and 1/2 cup parmesan cheese. Set aside. Spread 1 cup of pasta sauce in bottom of prepared pan. Cut egg roll wrappers in half. Place 10 halves on top of sauce. They will overlap. Top egg rolls with meatballs. Spoon 3 cups of sauce over meatballs. Sprinkle with 3/4 cup mozzarella cheese. Place 10 egg roll wrapper halves on top of mozzarella cheese. Spread ricotta cheese mixture over egg roll wrappers. Top ricotta mixture with 10 egg roll wrapper halves. Top egg roll wrappers with remaining sauce, remaining mozzarella and parmesan cheese. Bake for 1 hour and 10 minutes. Let stand 15 minutes before cutting. 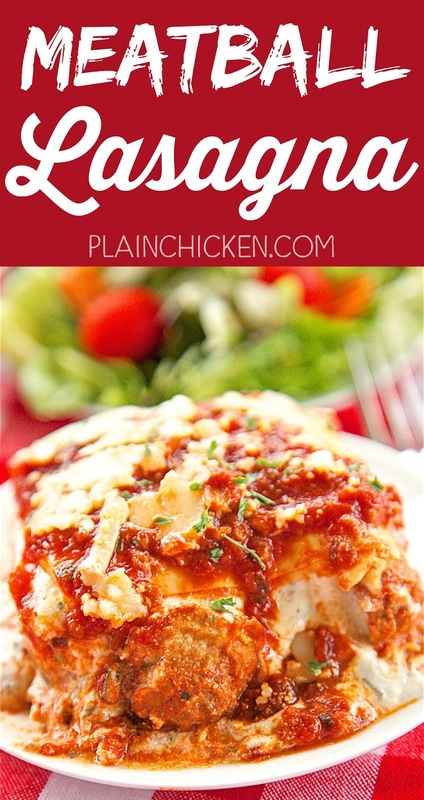 I'm always looking for new lasagna recipes to try -- this is so different and yummy looking! Can this be frozen and cooked later? Looking for meals to pack freezer for boat. I haven't frozen this, but I think it would be fine.